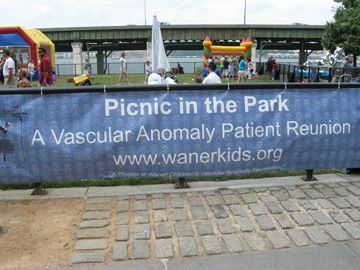 Navigating through the diagnoses and treatment options relating to a vascular anomaly can be overwhelming. As a parent and/or patient, it can seem impossible to put the pieces together. We are here to help. Emotional Support – Sometimes there is just nothing like speaking to someone who has been where you are, someone who has had a child go through the same treatment and sharing stories, frustrations and concerns. What to Expect – Where do we stay? Do cabs in New York require car seats? How do we use the subway? Which airport is best? Where do we fill prescriptions? What is the waiting room like at the hospital? These are all questions that are frequently asked – but sometimes we have others – and when answered can relieve a great deal of stress and anxiety. We are here to answer those questions and offer a bit of reassurance. If we do not have the answers, we can find someone who does. Insurance – There are a thousand questions about insurance. If you reach a place where you feel lost with your insurance – we are here to help support you in your efforts. Is there another patient just like my child – often it is so reassuring to speak to another patient or parent who has been through nearly the exact process that you are facing. We network as much as possible to connect parents with other parents of children who have a similar condition. he Parent Support division of the Vascular Birthmark Institute is ever changing and growing to meet the needs of the patients. The specific descriptions listed above are just the beginning. As the mother of a child who went through eleven procedures with Dr. Milton Waner, it has been my goal to continue to unite patients with reassuring information and support. Your participation can continue to further our efforts. If you would like to be included in a network of parents for patient support, please feel free to Contact Us. Together we can continue to support each other.